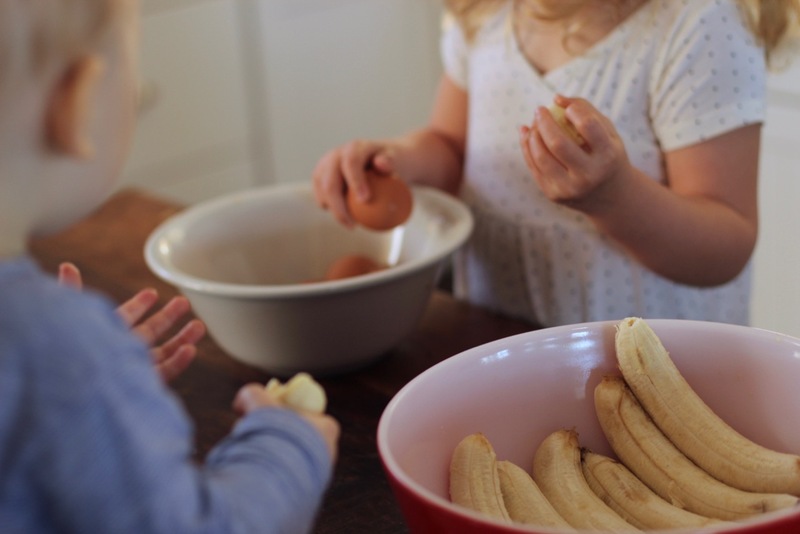 Ok, we actually call these ‘banana MAN-cakes’ in our house, since it was one of the first phrases my daughter said, and it made us chuckle, and now it has stuck… so that is what we really call them. 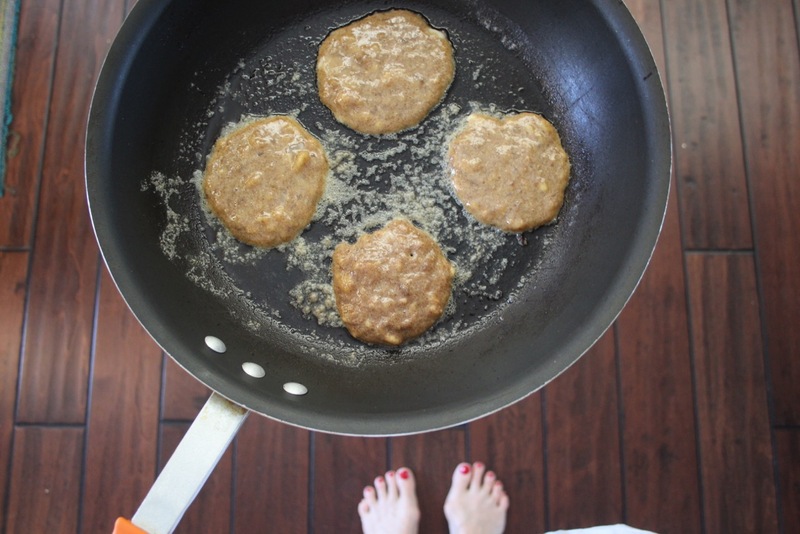 But whatever you call them, they are super delicious, quick to make, fuss free, healthy, and fabulous for the entire family! 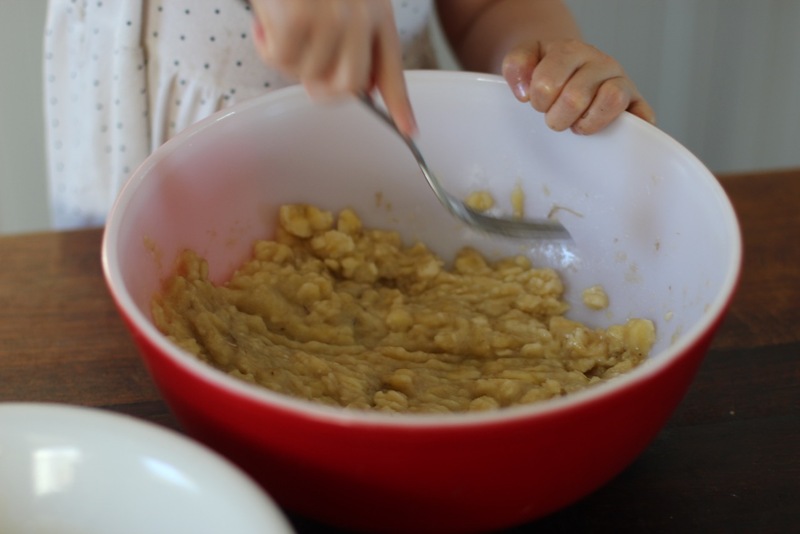 It is a family favourite, and we make them nearly once a week for breakfast, often eat leftovers as snacks, and they would also make a great dessert (with vanilla ice cream!). 1. Get your helpers ready and have them join the fun. 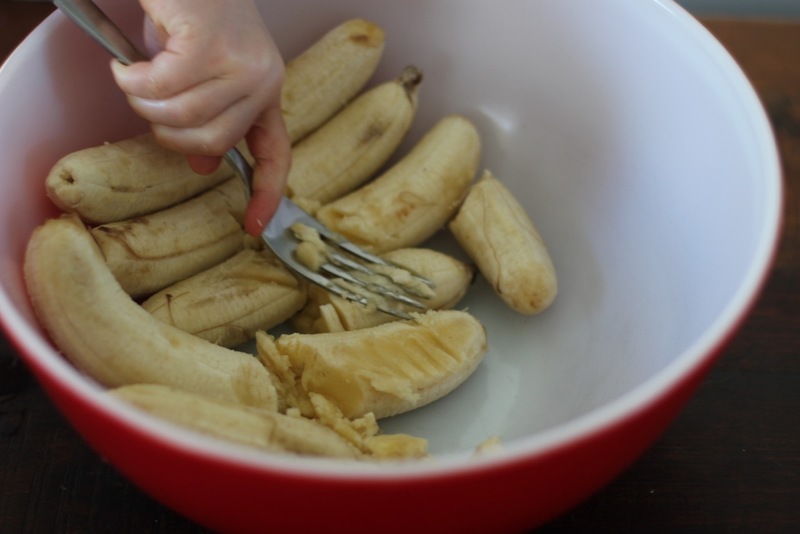 Peel and mash the bananas in a large bowl. Generally we use 6-8 bananas so we have leftovers. And don’t worry about the stringy bits on the banana, they just blend right in. *Note: The browner / more ripe the bananas, the easier it is to mash and cook them, not to mention they taste better too! I am always on the hunt for brown bananas, and my local green grocer in London often gives me the brown ones for free (they just dispose of them otherwise) so always ask before buying new bananas. 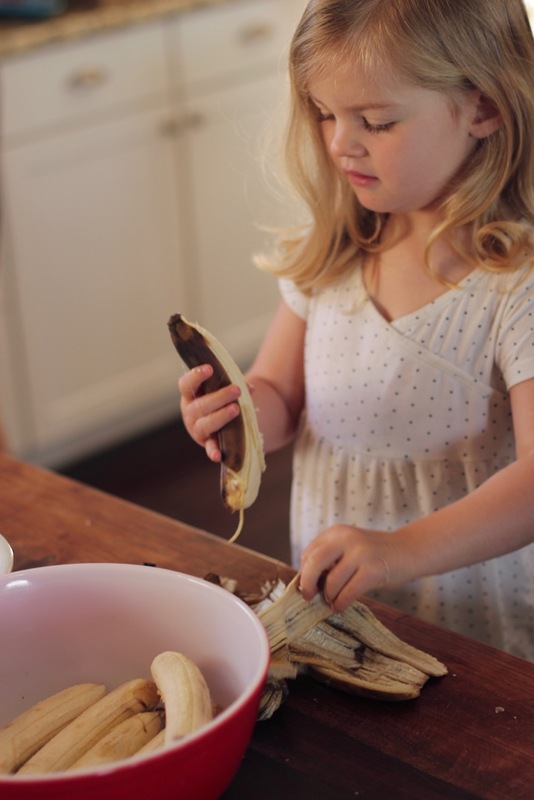 But if you have yellow bananas, simply peel the skins off of them the night before and leave them out on the counter or in the fridge (this oxidises them) and they will turn brown. And brown bananas mean more flavour! 2. Add cinnamon to the bananas. 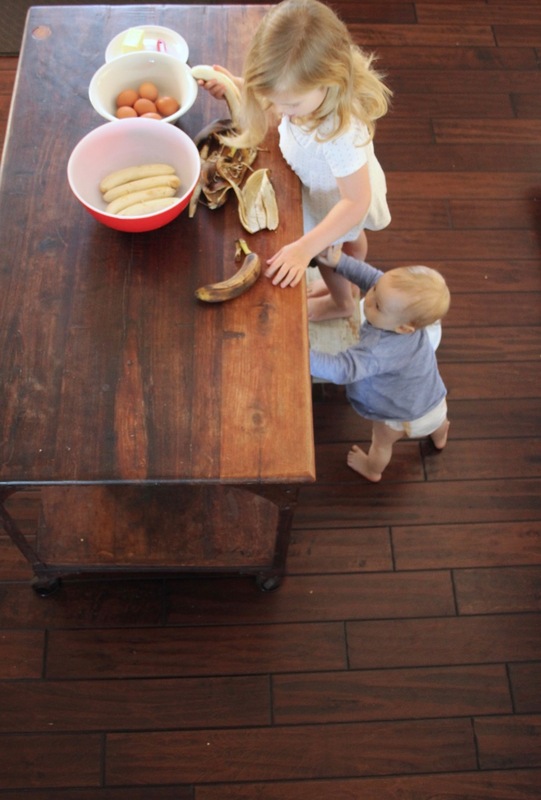 We love cinnamon so use 1/2 Tablespoon for 8 bananas. But too much cinnamon can mask the banana flavour. Do this step before adding eggs, it it mixes in easier. 3. 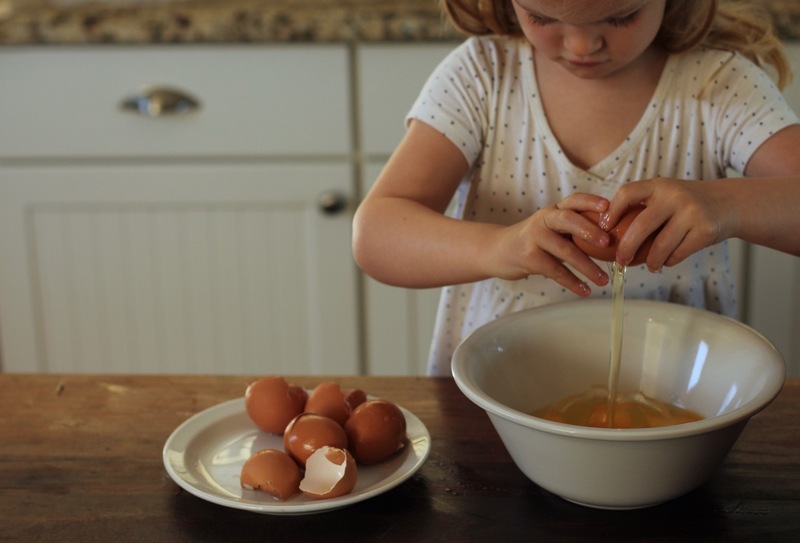 In a separate medium sized bowl crack the eggs and lightly beat. 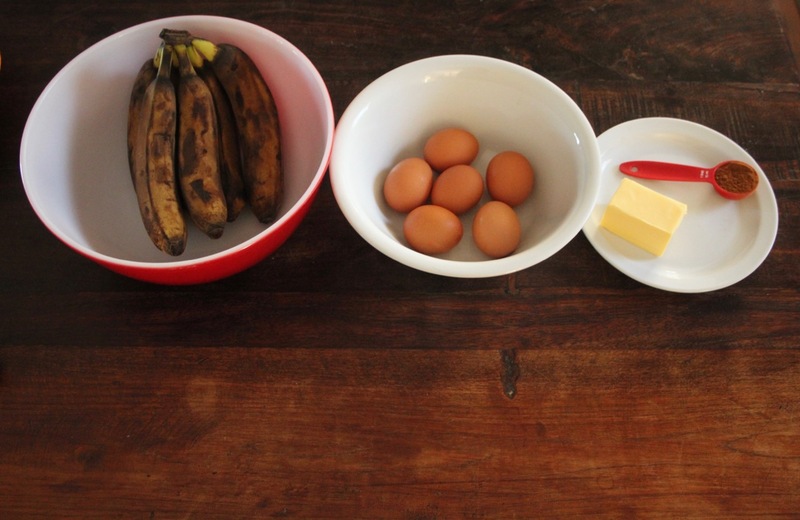 Use the one egg per banana ratio. 4. 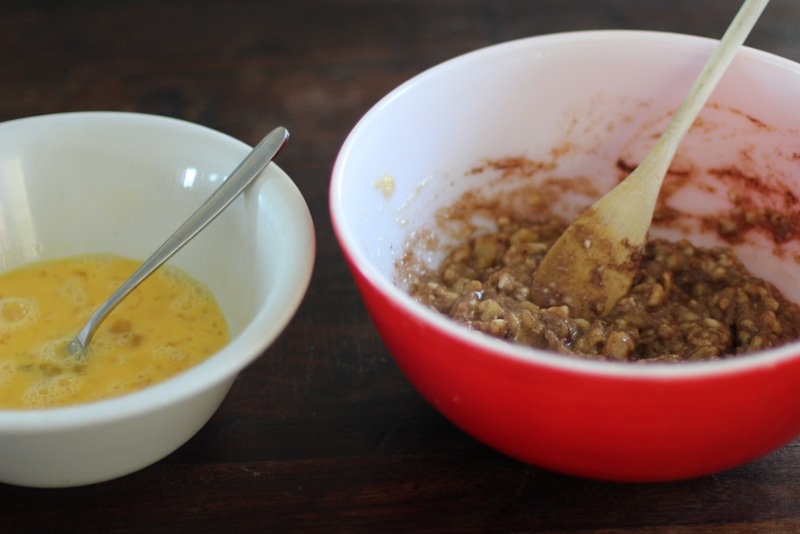 Mix egg mixture into banana mixture. It should be able to pour, similar to the consistency of liquid school glue. 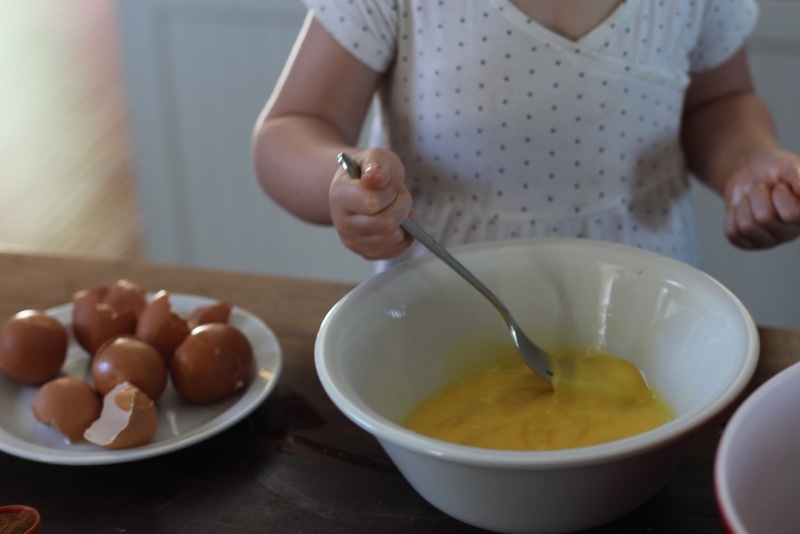 If it is too thick or doesn’t pour out of the spoon, add another egg (or two). If the mix is too thick, it will cook as easily. 5. In a large frying pan on medium heat, melt a pat of butter. 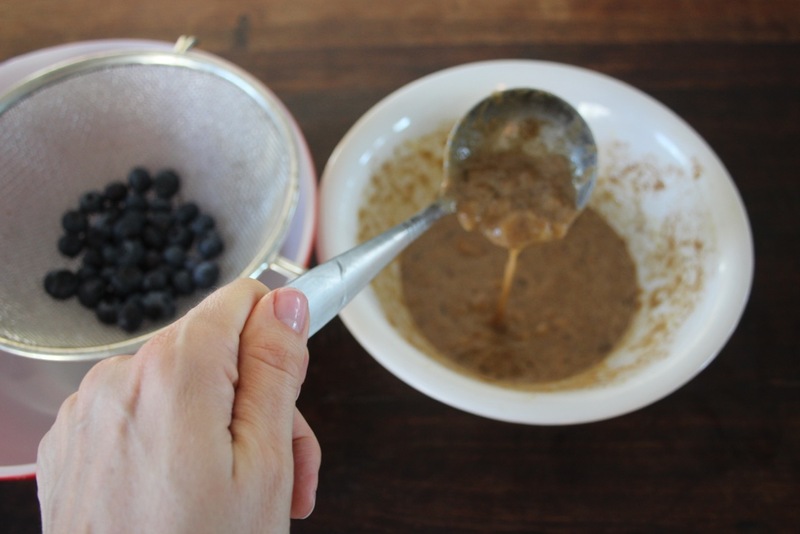 Once the pan is hot, spoon out the mixture with a ladle. 6. Flipping the pancakes takes a bit of practice since it isn’t a flour based dough. Flip them by ‘teasing’ the spatula under the edges of the pancakes before turning them over. Use a hard spatula if you can, I find bendy ones don’t work as well under the weight of the pancake mixture. 7. Once you finish one batch of ‘mancakes’ then wipe the frying pan with a paper towel (kitchen roll) before melting more butter. The wiping of the pan keeps the natural sugars from burning the next batch. I often remove the pan from the heat for a minute or two in-between batches so the pan doesn’t get too hot. You want to cook them slowly and low to medium heat is easiest to control. 8. 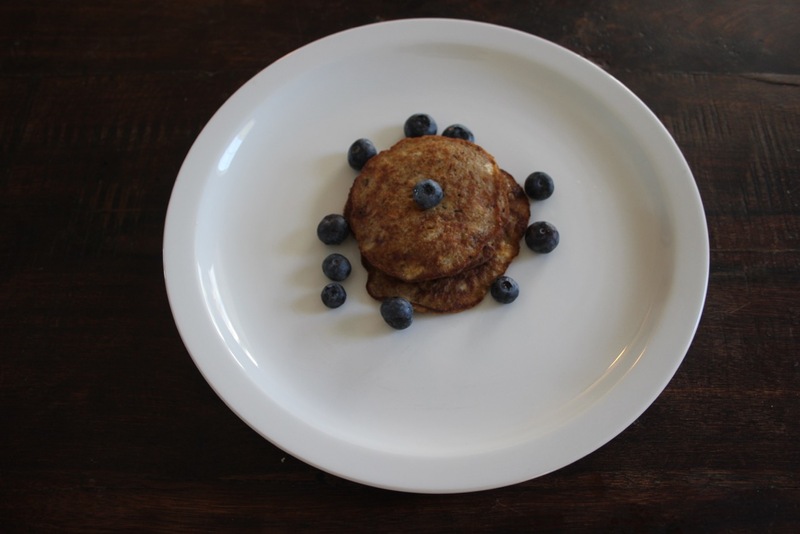 Keep the banana pancakes warm in the oven while you make each batch. We often serve our pancakes with some fresh blueberries and bacon on the side. Other optional ingredients can include: coconut oil (substitute the butter for frying if you want to go dairy free), and for accessories…blueberries, raspberries, or pecans. We find they don’t need any added butter or pancake syrup… they are sweet enough! But whatever makes your family happiest is the best way to serve them. My children love these! I make them every Saturday! We sometimes change them up a little and add different ingredients: dark chocolate chips, oatmeal, almond or peanut butter, and I usually throw in some chia seeds and flax meal and I cook them in coconut oil, but no matter how I prepare them, they are devoured! Sounds delicious… I love the idea of peanut or almond butter. Thank you.